This post originally ran in December 2013. We are rerunning it, with Parks and Recreation in its final season. 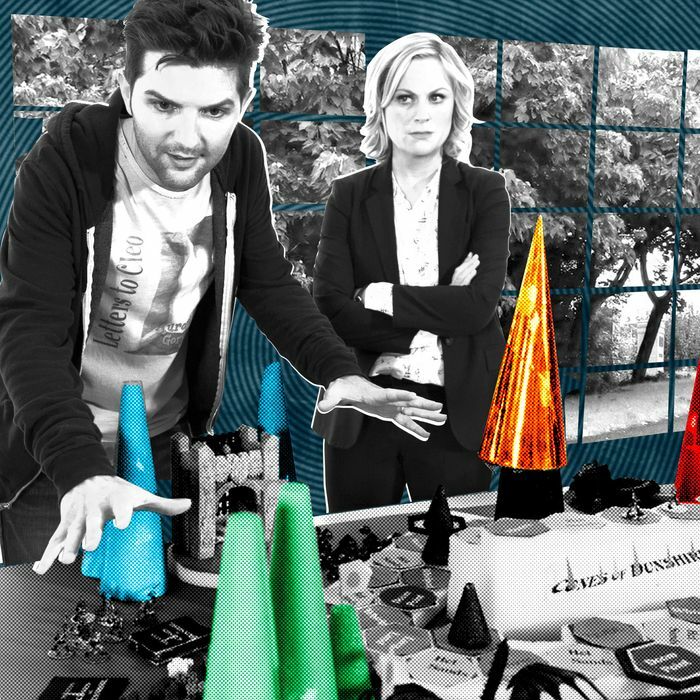 In the Parks and Recreation episode “The Cones of Dunshire,” which aired November 21, 2013, Ben Wyatt (Adam Scott) finds himself unemployed for one week and he spends the time “cooking up something pretty big” — namely, the obsessively detailed board game that gives the episode its title. 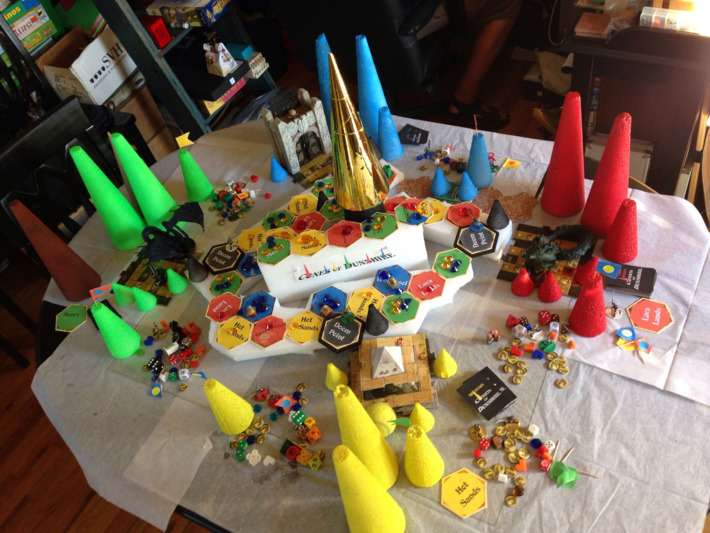 “Presenting … the Cones of Dunshire, a brand-new gaming experience [for] eight to twelve players,” he excitedly tells his interest-feigning wife, Leslie (Amy Poehler), before rattling off ever-nerdier details about his invention, including its goal (“to accumulate cones: Four cones wins, but in order to get a cone you have to build a civilization … which is where the Spirit Cards come in”), its hyper-specific character types (“two wizards, a maverick, the Arbiter, two warriors, a corporal, and a ledgerman,” the latter of which merely keeps score while wearing a hat that says Ledgerman), and its many quirks (“the thing about the Challenge Play is that it’s basically the game” — here, Ben opens his hand dramatically to reveal disc-shaped game pieces — “in reverse”). 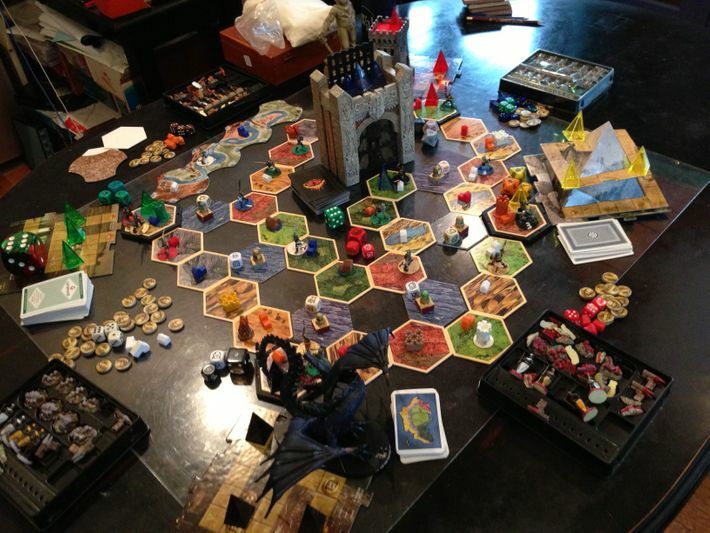 To build a prop worthy of Ben’s neurotic intensity, the Parks and Recreation producers turned to Mayfair Games, publishers of the meticulously crafted strategy game The Settlers of Catan. Vulture spoke with Adam Scott, Parks and Recreation honchos, and the Mayfair Games brain trust to find out how the game was dreamed up, whether the cones are, in fact, a metaphor, and if we’ll ever see Ben’s creation in stores. Morgan Sackett (executive producer, Parks and Recreation): A bunch of our writers are fans of Settlers of Catan. Ben Wyatt played it at his bachelor party; he was a huge fan, he was nationally ranked in that game — all those things that we put into an episode last year. King: The idea was that this would be a kitchen-sink-type thing; it would have elements of Dungeons and Dragons where there were dice, and Catan elements where there would be actual hexes and resources. We all talked about our favorite games, like Dominion and Ticket to Ride, and what elements we could borrow from those. We just wanted to paint the picture that he had spent a week in a rabbit hole of gaming and come out the other end with no clear game — just like a hundred game pieces that vaguely fit together. I think cones came up instantly, like, “Oh, there should be three-dimensional cones.” Someone said, “You should roll the dice to see how many dice you roll.” Everyone was pitching out ideas. It was the fun of adding details on top of details on top of nonsense. Sackett: The point where I had a real script to describe what we needed was only about two-and-a-half weeks before we shot the episode. Fenlon: He offered to push filming back a week, but we talked it over and we said, “No, we can put something together in a couple weeks.” And we could do that because we didn’t have to have a working game so much as a prototype, which is just a physical game that met the specs that were described in the story and was visually evocative. So we basically said, let’s give it a shot. 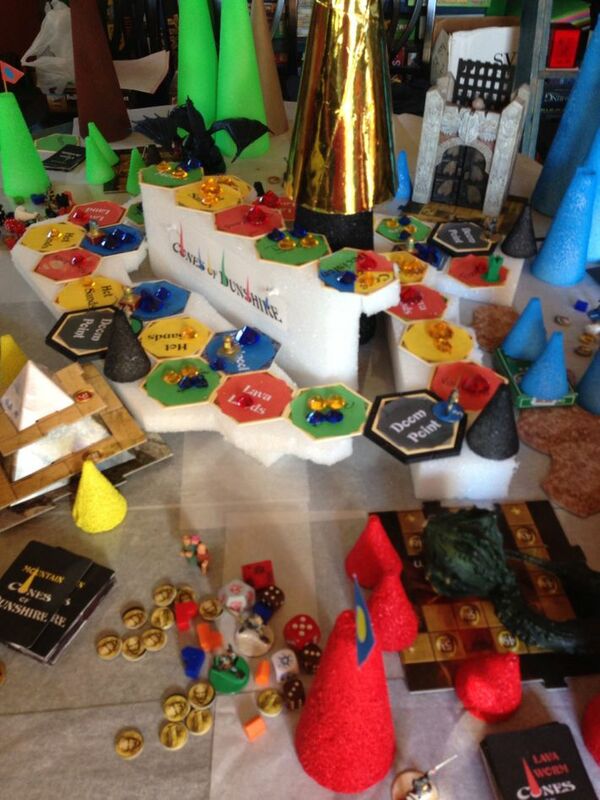 Coleman Charlton (project director, Mayfair Games): One thing we wanted was to have hexes, so it implied Catan. So I started by putting a bunch of hex tiles on a board in a big spiral with crossover plays and adventures on each of the corners. Of course, I didn’t have any big cones lying around, so I used little pyramids. Fenlon: So, Coleman put this first prototype together, and we had a Skype meeting with the Parks & Rec art director and creative team to go over the specs. And they said to us, “It’s almost there, but (1) we want this huge emphasis on the cones, (2) we want it to be very colorful, and 3) we want it to be relatively simple in its nature, very arts-and-craftsy, as if it were put together by a guy who’s not necessarily very good at this.” And once we left the conference with their comments, I think we just nailed it. Charlton: Luckily, [the crafts store] Michaels already had cones out for Christmas, in all different sizes. No question, if it had been two or three months earlier, they wouldn’t have been available. Fenlon: So we went to Michaels for some additional craft materials, especially the gems and stuff. We even went to the farmers’ market and got a gourd that looked like it might be a good lava worm. It was just a crazy pastiche of stuff. Charlton: And we wanted to make it look like something that somebody who had a bunch of old games put together themselves. If you look really closely, you could probably recognize which games some of the stuff comes from. Morgan Dontanville (art director, Mayfair Games): Even though Ben is obsessive about this game, we put in a lot of errors that he’s mended. We misspelled desert as “dessert” and crossed it out and then changed it to “hot sands.” I tried to overglue some stuff. I peeled stuff off and put stuff on and peeled stuff off and put stuff on. So I tried to create the idea that he was obsessive to the point where it causes damage. I didn’t know how much was actually going to be shown, so I wanted to do as much detail work as possible. Adam Scott (Ben Wyatt): I hadn’t seen the game until we got there to shoot the scene, and it was beyond my wildest expectations. It was very thorough. Like, this is the work of a madman. King: I wrote a bunch of rules up that it is probably almost impossible to actually build a real game around, but we wanted something just for Adam to be able to reference at any point. When we shot it, Adam did a lot of ad-libbing, which was hilarious, and we also just wrote a bunch of what we call “wild lines.” So I would just stand off-camera and feed him lines like, “Are the cones a metaphor? Well, yes and no.” As a staff, we had all written up probably five pages of those because it was so much fun to do. Scott: I remember just not wanting to screw it up, because it was incredibly important to Mike Schur. This Cones of Dunshire thing was near and dear to his heart. And there were so many specifications and guidelines, things that I could not get wrong. Mercifully we shot it in three or four separate chunks, so I didn’t have to memorize all of it in one go, which made the whole thing a lot easier. Dontanville: In the extended cold open, Ben talks about cone covers — which was improvised from the fact that we actually made those. When you get to the Cone of Decision at the center of the game, then you can decide to either put the cover on the cone or take the cover off the cone. And that determines whether you choose the dark side of the cone or the light side of the cone. And apparently they ran with that. Scott: When I was a kid I was into comic books, and I kept them all in plastic bags and would get really annoyed when anyone would not treat them with the utmost of care. So I tapped into that, I guess. Charlton: Also, there’s a huge market in gaming for card sleeves. People who play games and don’t want to ruin the cards buy tons of card sleeves. So when he’s talking about cone covers, it’s really an inside gamer joke. Sackett: We shot a lot of stuff. Way more than you would normally do on a little cold open like that. I think Amy Poehler was sort of befuddled by the whole situation. [Laughs] Amy doesn’t get it at all. Or maybe she gets it, but she doesn’t have a lot of interest in it. So she was standing there probably as horrified as Leslie Knope was. Scott: Amy just thought it was ridiculous. And it was. Dontanville: I guess the game is playable right now … but do you mean “good?” Honestly, we could probably bust out a set of rules in, like, three nights. Charlton: I mean, if we talked about the ideas we have for the game, we’d be just like Ben was on the show. Fenlon: We’ll have a game by August of next year, for sure. It was never our plan, and it is not now our plan, to make a commercial version of Cones of Dunshire. But there will definitely be a staging of Cones of Dunshire next summer at GenCon in Indianapolis, which is the biggest game show in the United States. It will be big and festive and probably for charity. It’s our hope for the Parks & Rec guys to be there, for Ben to play his own game. Scott: That would be amazing. I want to be on the box. Sackett: Our intention on Parks and Recreation is that somehow Cones of Dunshire is going to come back around. King: I mean, let’s put it this way: It ended up in the hands of those accountants, who will hopefully spread the Word of Cone as much as Ben would.